Special Price with Free Shipping! The New Standard in Portable Cooking Equipment. Collapsible and fold-able design. One unit has Two cooking sizes, 3 foot and 5 foot configurations allow flexibility at multiple locations. 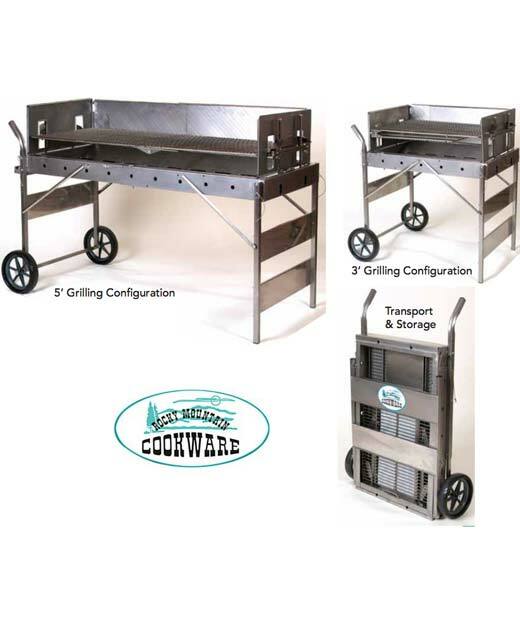 Stainless Steel Construction is Ideal for Caterers and Tailgaters. Fold and Go design. Wind Guard is standard. 5ft. x 2ft. folds into two wheel dolly. Two Cooking sizes in one unit. Unique Vent/Ash pan burns hotter and more efficient, using less fuel. Also makes Clean out quick and easy. Easy to Adjust Height Control.